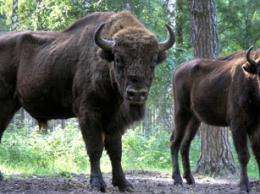 (PhysOrg.com) -- The European bison, a close relative of the American bison, has been on a slow road to recovery for almost a century. Europe's largest grazing animal once dwelled from central Russia to Spain, but by the beginning of the 20th century, habitat loss and hunting had reduced them to 54 animals. After almost a century of conservation and reintroduction efforts, about 2,600 wild European bison live in scattered herds in eastern Europe, says Tobias Kuemmerle, a post-doctoral researcher in forest and wildlife ecology at UW-Madison. Because all these European bison descended from just 12 ancestors, they are genetically alike, and therefore wild herds numbering more than 1,000 would be required for long-term survival. And unless these animals are able to breed rather freely, their genetic similarity will make them susceptible to disease and climate change or other environmental disturbance. But does crowded Europe have enough habitat for such a large herd? To answer these questions, Kuemmerle analyzed data from radio collars and local experts, trying to nail down the animal's habitat preferences. Although scientists had thought that the European bison preferred closed deciduous forests, the new data suggests a preference for a "mosaic habitat of forests and open ground," says Kuemmerle. "They did not prefer deciduous forest, but also used mixed forest, or even a coniferous forest. Our results show that European bison can tolerate much broader environmental conditions than previously thought." These preferences may be ideal, given how the landscape of eastern Europe is changing, Kuemmerle says. "Eastern Europe is unique; it's had a massive change in the factors that drive land use," Kuemmerle says. "After the collapse of socialism, millions of acres of farmland were abandoned. Rural populations are declining, and the human pressure in some regions is decreasing." At the same time, the European Union expanded eastward and provides incentives for landowners to prevent brush from overgrowing abandoned fields. These conditions are propitious for bison, Kuemmerle says. Bison conservationists have already looked at the Carpathian Mountains, a low range that occupies parts of the Czech Republic, Poland, Slovakia, Ukraine, and Romania, as good bison habitat, and Kuemmerle's study confirmed that the mountains may be ideal for a self-sustaining European bison herd. The Carpathians seem to have more than enough land needed for 1,000 European bison, which Kuemmerle estimates at roughly 2,000 square miles. "It's a fairly wild region, very similar to the Appalachians in topography," Kuemmerle says. "It's relatively marginal for agriculture, has large forests, and already has a few wild bison herds." Other social factors needed for a strong conservation program are also positive, at least in some countries, Kuemmerle says. "Poland has pioneered bison conservation, and the Polish identify with the bison as a source of national pride." But a substantial bison conservation effort would require that the animals be able to move, to mix up the remaining genetic diversity, and so all of the nations that share the Carpathian Mountains would have to host the animals, Kuemmerle says. The study, together with a map showing the best bison habitat in the Carpathian Mountains, appears in the current issue of Biological Conservation. Kuemmerle worked with Kajetan Perzanowski, a bison researcher from the Polish Academy of Sciences, and other colleagues in eastern Europe. At UW-Madison, Kuemmerle collaborated with Volker Radeloff, an associate professor of wildlife ecology who has focused on the ecological impact of communism's collapse, and Donald Waller, an associate professor of conservation biology. While conservation biologists usually look at habitat destruction, this study looked at an opposite trend, Kuemmerle says. "This is very different from the situation that we usually study, where natural ecosystems disappear and biodiversity is lost. In eastern Europe, natural ecosystems in some areas are coming back as the farms disappear. It's a 'rewilding' process that brings a conservation opportunity to restore the populations of some of Europe's large mammals." For survival, however, "We need bigger herds, more herds, and connectivity for the exchange of genes among the herds," Kuemmerle says. "All these goals can only be achieved if we find more habitat and establish corridors between the populations." This is great news. I always wondered about this species being a forest species, unlike the North American relative. Sounds like its habitat preferences may be a bit more diverse than we thought. I like the fact that natural "rewilding" is occurring in eastern Europe. Bring it on. If allowed to grow far bigger in numbers, they could each save 5lbs of grain for each lb of bison meat. In the US we have the same thing, many farms abandoned and much national land that they formally roamed that could be used for them and make it far more ecologically sound. Since we have killed all the predators we need to eat the deer, elk, moose where they have outgrown their habitat which is most places now and that damages badly an ecosystem in a sustainable way.